Congressman C.A. Dutch Ruppersberger will speak at the Satellite Executive of the Year 2017 Award Luncheon at SATELLITE 2018. Congressman C.A. 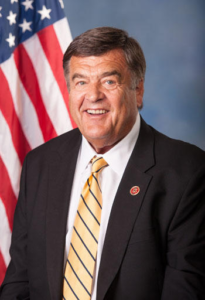 Dutch Ruppersberger is serving his eighth term in the United States House of Representatives for the citizens of Maryland’s 2nd District. Congressman Ruppersberger is known as a common sense consensus builder who works with Members from both sides of the aisle to get results for Maryland and the nation. Congressman Ruppersberger currently serves on the powerful House Appropriations Committee, including the Defense, the State, Foreign Operations and Related Programs and the Homelande Security subcommittees. The Appropriations Committee is responsible for allocating hundreds of billions of federal dollars each year. The assignment comes after a committee-record 12 years serving on the House Intelligence Committee, including four as Ranking Member. Congressman Ruppersberger was the first Democratic freshman ever appointed to the committee, which oversees the collection and analysis of intelligence from around the world to ensure our national security and prevent potential crisis situations – especially terrorist activity. He traveled to more than 50 countries including Iraq, Pakistan, Afghanistan, Yemen, China and Venezuela during his time on the committee. On the committee, he developed a reputation for bipartisan leadership with then-Chairman and Republican Mike Rogers. Beginning in 2011, the pair worked together to pass five intelligence authorization bills over four years — after a 6-year period without one — as well as bipartisan cybersecurity legislation. In 2015, they became the first dual recipients of the prestigious William Oliver Baker Award from the nonpartisan Intelligence and National Security Alliance for their pragmatic leadership. Congressman Ruppersberger previously served on the House Government Reform and House Armed Services Committees, where he worked to help keep our country safe and make sure our veterans at home, as well as our warfighters on the frontlines, have the resources they need. Maryland’s 2nd District includes parts of Baltimore City as well as Baltimore, Anne Arundel, Harford and Howard Counties. It is a vital center of trade and commerce for the state and national economy and includes the Port of Baltimore and the hundreds of businesses and manufacturing concerns dependent on it. The 2nd District is also home to the National Security Agency, Fort Meade, federal Cyber Command, Aberdeen Proving Ground, the Coast Guard Yard at Curtis Bay and other installations essential to the country’s national security. Creating jobs and improving Maryland’s economy is one of Congressman Ruppersberger’s top priorities. He is working hard to help middle-class Marylanders achieve more than just making ends meet. The Congressman is also fighting to keep our country safe and get our first responders the funds they need to protect our communities and our families A former assistant state’s attorney in Baltimore County, Congressman Ruppersberger decided to run for office after a near-fatal car accident while investigating a drug trafficking case. Thanks to the dedication of doctors at the University of Maryland Shock Trauma Center, Congressman Ruppersberger survived and began campaigning for office to assist Shock Trauma after they saved his life. He remains an active supporter of the hospital, serving as Vice Chairman of its Board of Visitors. He also serves on the United States Naval Academy Board of Visitors Congressman Ruppersberger has served in public office for more than 30 years. He was elected to the Baltimore County Council in 1985 and again in 1989, chosen twice as council chairman. He was elected Baltimore County Executive in 1994 and 1998, and, under his leadership, the county was named one of the nation’s four best-managed counties by Governing Magazine. The county achieved three AAA bond ratings and staggering job growth during his administration. A native of Baltimore City, Congressman Ruppersberger spent his summers as a lifeguard and police officer in Ocean City, Md. He attended Baltimore City College and the University of Maryland College Park, where he played lacrosse. He earned his Juris Doctorate from the University of Baltimore Law School. The Congressman has been married for 46 years to his high school sweetheart, the former Kay Murphy. Together they have two grown children, Cory and Jill, and three grandchildren, Camden, Parker and Libby.